In stock -This product will ship today if ordered within the next 13 hours and 14 minutes. The Natural Konjac Facial Puff Sponge is ideal for all the family as it deeply cleanses, removes blackheads, helps to balance pH levels and gently exfoliates the skin. The unique net like structure of the vegetable fibres helps to stimulate blood flow and promote skin cell renewal. At approximately 8cm wide, it fits perfectly in the palm of your hand for easy cleansing. 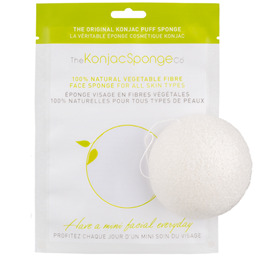 The Natural Konjac Facial Puff Sponge is additive free, suitable for sensitive skin and removes water-based makeup leaving the skin feeling radiant and rejuvenated. Below are reviews of The Konjac Sponge Co Konjac Facial Sponge - White by bodykind customers. If you have tried this product we'd love to hear what you think so please leave a review.